Electrostatic micro particle air filter. MPR 600. Electrostatically charged ''Filtrete" fibers attract and hold particles like magnets. Captures large airborne allergens including mold spores, pollen and large dust particles. Good for high velocity equipment. Use for full three months of air quality protection under normal conditions. Meets the American Lung Association and its Health Project Indoor Air Quality Guidelines. Anti-bacterial treated; traps minerals. Fits most Emerson humidifiers. Metal reinforcement. Adds rigidity to shape of the wick filter when moistened. Also adds stability with today's softer, more absorbent paper. Prevents "slumping" or "sagging" over time or when wet. Helps maintain the humidifier's designed output. Wick filter fits Emerson Floor Register HD500, 6200, 7002, 7005 (HDC-2R) 1205, 1211 and 2412 need 4 filters (HDC-411);Kenmore 14407, 14451, 1442, 29974 (14909), 14413, 14416 needs 4 filters (14912) 2pk. Anti-bacterial treated; traps minerals. Fits most Holmes humidifiers. Metal reinforcement. Adds rigidity to shape of the wick filter when moistened. Also adds stability with today's softer, more absorbent paper. Prevents "slumping" or "sagging" over time or when wet. Helps maintain the humidifier's designed output. Wick filter fits Holmes HM850, 3400, 3500, 3501, 3600, 3607, 3608, 3640, 3641, 3650, 3655, 3656 (HWF-75) (#D); Sunbeam SCM3501, 3502, 3609, 3656, 3657, (SF221); Touch Point S120E-A, S120-E-C; White-Westinghouse WWHM3300, 3500, 3600 (WWH35); Bionaire W12, W14, W15 (BWF1500-UC). Anti-bacterial treated; traps minerals. Fits most Holmes humidifiers. Metal reinforcement. Adds rigidity to shape of the wick filter when moistened. Also adds stability with today's softer, more absorbent paper. Prevents "slumping" or "sagging" over time or when wet. Helps maintain the humidifier's designed output. Wick filter fits Holmes HM1800, 1840, 1845, 1850, 1851, 1855, 1865, 1888, 1889, 1895, 1975, 2059, 2060W, 2090, 3000, 3850 Note: 3800,3850 needs 3 fltrs, 4000 needs 2 filters (HWF-65); Sunbeam SCM1895, 1896, SCM1866 (SF206); White-Westinghouse WWHM1840 2090ZE (WWH650); GE 106609, 106663, 106763; Bionaire BCM-1845, 1855. Reinforced design for longer life and better efficiency. Traps impurities in the water. Wick filter fits Holmes HM1645, 1730, 1745, 1750, 2200, 2220 (HWF-64) (#B); Sunbeam SCM1746, 1747 (SF213); Touch Point S30E, S30E-A; White-Westinghouse WWHM1645, 1750ZE (WWH640; Hamilton Beach 05520, 05521 (05920); Bionaire BCM1745 (BWF-64). Helps reduce allergens and microscopic particles from the air in their homes. MPR 1000 captures large airborne allergens like household dust, pollen, and mold spores. Attracts and captures microscopic allergens like pet-dander, smoke and smog particles. Lasts up to 3 months. 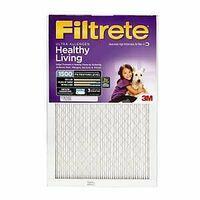 Only Filtrete filters carry the American Lung Association Health House Logo. Electrostatic micro particle air filter. MPR 600. Electrostatically charged ''Filtrete" fibers attract and hold particles like magnets. Captures large airborne allergens including mold spores, pollen and large dust particles. Good for high velocity equipment. Use for full three months of air quality protection under normal conditions. Meets the American Lung Association and its Health Project Indoor Air Quality Guidelines. Reinforced for longer life and has Microban antimicrobial product protection. Works with: HM1281, HM1701, HM1761, HM1297, HM2409, HM1100, HM1300,HM5100, SCM4100, SCM1100. Reinforced design for longer life and better efficiency. Traps impurities in the water. MicroFree. Wick filter fits Spacesaver 800, 8000 series console (1043). Trapmax filter technology. Antimicrobial protection. Highest capacity output.Fits 300, 500, 700 DP3, D46 and B23 Series. Microban antimicrobial product protection. Reinforced for longer life. Holmes filter fits: HM-1730, 1745, 1750 and 2200. Meets original manufacturer's specifications. Fits most Emerson and Kenmore humidifiers. Metal reinforcement. Adds rigidity to shape of the wick filter when moistened. Also adds stability with today's softer, more absorbent paper. Prevents "slumping" or "sagging" over time or when wet. Helps maintain the humidifier's designed output. Universal wick filter cut to fit (6-1/4 x 11 x 4-1/2"). Fits most Holmes, GE and Bionaire humidifiers. Metal reinforcement. Adds rigidity to shape of the wick filter when moistened. Also adds stability with today's softer, more absorbent paper. Prevents "slumping" or "sagging" over time or when wet. Helps maintain the humidifier's designed output. Universal wick filter cut to fit Holmes (7-1/2" x 33-1/2 x 7/8"). Round filter with microban. CarbonX filter technology. For use with: HM1855, 1800, 1850, 1845 and 1865. HEPA - type technology removes up to 99% of airborne pollutants. Traps and Locks 30% more dust and particles from your home. Contains Arm and Hammer baking soda for odor elimination. Replacement wicks (filters) for Vornado Vortex Whole Room Humidifiers. Dimensions: 9.75" H x 7.75" W x 3.75" D. 3M Ultra Allergen Reduction Filter, Ultra, Series: Filtrete, 30 in Length X 12 in Width X 1 in Height X 1 in Thickness, For Residential Applications Fits Models: Bemis and Essick Air Humidifiers: 821-000, 821-001, 826-600, 826-800, 826-900, 8266, 8268 and all other 800 series. Essick Air Pedestal Humidifiers: EP9-500, EP9-700, EP9-800, EP9R-500, EP9R-800.